Herbal Corner – The Winter Chills! When it’s freezing outside, so how can we combat those winter chills? Well, there are some things we can do that don’t involve taking herbs at all. Firstly, when you go outside wrap up warm; putting a scarf around your neck to cover your nose and mouth will help to filter the cold air and shelter your respiratory tract from the wind. Many years ago, before the days of electricity and gas, our sleep patterns were more in line with the day and night time hours. It’s during the season of long nights and short days that we need more sleep. When our body is resting it helps repair itself, sleep is indeed a great healer! 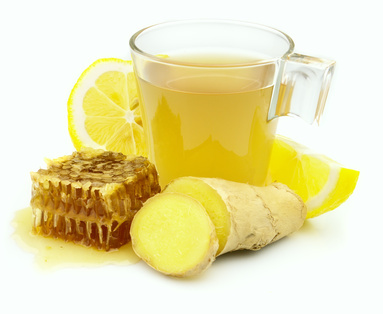 Drinking hot water with lemon and honey added can give your immune system a boost; a slice of fresh, or pinch of dried ginger added is tasty and helpful to boot!! Using plenty of garlic and other hot spices helps prevent the body from getting too cold. Try ginger tea or use it in cooking along with other heating spices such as cinnamon, black pepper and chilli. So, the best thing to do if you feel yourself coming down with something is to eat something as hot (spicy heat not just temperature heat) as your taste allows – chilli or curry perhaps and make sure you get lots of sleep. Echinacea spp (purple coneflower) is well known these days for helping to boost the immune system. It certainly does do that, supporting the body to do what it needs to do to fight winter infections and viruses. As well as helping prevent infection, Echinacea may reduce the duration too!! Another helpful herb is Sambucus nigra fructus (elder berries). These rich berries also have antioxidant properties and have been proven to support the immune system and help fight the flu virus. You might also be interested in my previous blog post Winter Herbs for some other great tips how to stay healthy in the winter. Please do not hesitate to contact me should you need more information, and remember, seek professional advice from a Medical Herbalist if you are pregnant, breastfeeding or taking any medication.